Receive a FREE HOLIDAY BLEND! Fill your home with the inviting scent of the holidays! The warm, sweet aroma creates a welcoming environment for holiday gatherings and can be diffused every day to purify the air and uplift the spirit. This proprietary blend combines Wild Orange, Cinnamon, Nutmeg, and Clove with the fresh and airy scent of Siberian and Douglas Fir, creating an essential oil blend that is a Christmas tradition. 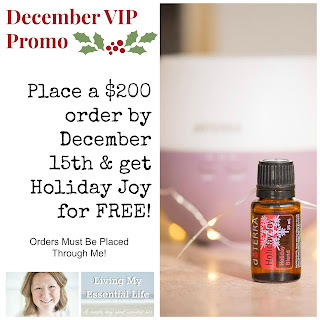 Diffusing this blend throughout your home will uplift the soul and warm the spirit as it fills each room with the joyful scent of Christmas. Ingredients: Siberian Fir, Wild Orange, Clove Bud, Cinnamon, Bark, Cassia, Douglas Fir, Nutmeg essential oils and Vanilla Absolute.